Almost every geek is fascinated to Linux's complex beauty, security and flexibility but if you are a non-linux user or a beginner it is going to be headache to even extract a zip file and install a program using terminal. So if you want to learn Linux then I would strongly recommend you to read Linux Command Line and Shell Scripting Books, eBooks or PDFs to enhance your skills from scratch. Linux is all about commands and codes without it, its nothing but surely it has been introducing nice looking GUIs since its dawn yet most of the task are done through terminal. And its nothing difficult once you begin doing it yourself, all you need is good resources and Linux PDF eBooks are said to be an excellent sources of learning quickly and easily. One of the best Linux book featuring complete introduction of command lines from basic file navigation to advance topics such as writing programs in Bash. It feeds you very practical examples and explains everything with in-depth tutorial. The initial part serves as an introduction and teaches fundamental lessons like manipulating files and directories, package installation, keyboard tricks etc and then it takes you to advance level of networking, package management, redirection, editing with Vi and compiling programs. You will also learn to automate boring tasks using Shell Scripting. It is very beginner friendly with easy digestible chapters and lots of illustrations as well. If you are an absolute beginner and want to learn from very basic then this book is for you. It's a very helpful short read for newbies because its primary concern is mastering your base by teaching you important Command Lines and Tools. It teaches with step-by-step tutorials and unfolds some amazing tips and tricks, However it also contains loads of guides on Installation and getting started along with brief introduction of Linux distro, And after that it gives some serious practical lessons on Installing Softwares, Redirection and File Editing commands and wildcards too. This is the best book for Linux commands because it contains hundreds of commands with clear explanation and tutorials on topics such as Programming with Shell Scripts, Media, Text manipulation and pipelines, User management, controlling process and all other important commands which makes you a power user. Whether you are a novice, expert or a daily user you should always have it in your pocket for a quick reference guide. I personally suggest this book to everyone as it is capable of making you Linux ninja. Do you want to become expert at Command Line and Shell Scripting? then is what you need. This is a all in one Linux book covering wide range of lessons on Shell Scripting and Command Line fundamentals. It will actually teach you how to directly communicate with your computer using codes giving you more capability and time. The major part of the book is filled with immense guide on Creating Practical Scripts, Understanding and Creating Shell. You will learn to write simple script utilities to automate task, Dash and Bash Shell and Work with like nano, KDE and GNOME editors. It also features one of the largest list of Linux commands cheat sheet. OWASP - Broken Web Application (BWA) is a highly vulnerable web application developed and distributed by OWASP. The main objective is to aware web developers about common web vulnerabilities and to make internet more secure place. The another major use of OWASP BWA project is as a penetration testing lab widely used by hackers and security experts. You will need VMware Player and OWASP BWA Project setup ― its a pre-made virtual machine file which doesn't require any configuration. After downloading, Install VMware player and extract BWA file and open OWASP Broken Web Apps.vmx file. This will start virtual machine setup, Just proceed as it says and that's all its installed. CEH is one of the best ethical hacking course for beginners, it teaches you alot of basics which is very essential to step in InfoSec field. I have shared general info related to CEH certification training, exam, fees, study guide PDFs and books. CEH is an ethical hacking course consist of penetration testing and information security training. CEH version 8 is the latest version as of late 2013 and there is no eligibility for CEH training however if you are applying directly for an exam then you will have to show two years of information security related work record. You can either apply for CEH Training + Exam or only Exam (In this case you will have to self-study). CEH Training or Straight Exam? What to choose? If you want CEH certificate and you don't know anything about ethical hacking then you will have to get training first but if you have already self studied ethical hacking and just want to get certified then you should straight apply for an exam. Its just the difference of cost and time although training is more beneficial because it increases the chances of getting good grades. Below is the CEHv10 Training module. The training can take up to 1 to 2 weeks depending on your time investment. CEHv10 is consist of 20 core modules. CEH exam may not be so easy but if you are trained well you can crack it easily. CEH training fee is $500 and exam fee is $100. 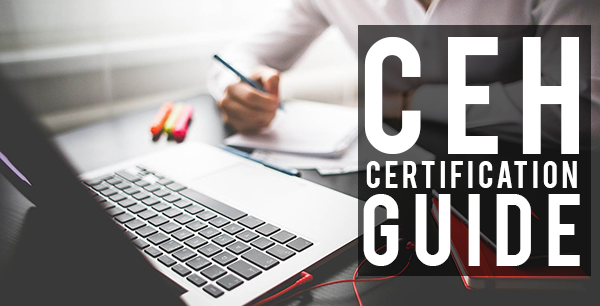 The cost of CEH depends on certificate provider or institute. Online training+exam will all cost you roughly $600 USD (EC-Council). You can also get it for more cheaper price from third party websites or training provider. Where to apply for CEH training? You can either apply for online course or look for an institute in your city. In my opinion online is more better and convenient and if you are preparing for self study then you will have to work hard even more. EC-Council is probably the best online CEH training and certificate provider. Self-Studying candidates will definitely need study guide PDFs and books. Self-study is not a bad idea, its just little challenging. Whether you apply for straight exam or training courseware materials are essential for learning. Study guide books will help you lot strengthening your ethical hacking knowledge as well as practical skills. After giving exam, if passed you will get a valid government recognized C|EH Certificate which plays very significant role in getting InfoSec jobs. In my upcoming post, I will write about job opportunities for certified hackers. Stay tuned. Kali Linux is an extremely advanced pentesting platform designed for hackers and security experts to make their task easier. For a beginner it might be little difficult to grasp it because of lack of proper guide and training, but you can easily learn from books available online. I have mentioned few best Kali Linux Books, eBooks and PDFs for beginners as well as experts. Kali is very popular among hackers because of its environment, it has hundreds of hacking, pentesting and forensics tools which allows us to gather information, find vulnerabilities and create exploits. It can be used as destroyer as well as creator, that depends on you, but to perform such awesome actions one needs to have great hacking and pentesting skills. To become an expert hacker you must strive to improve your pentesting skills with Kali by learning new things daily and believe me books has the potential to make you master despite being a newbie. All you need is basic programming knowledge. This is the perfect book for beginners to get started because it teaches you from starting points like Introduction & Overview, and later on covering topics such as Metasploit, Exploiting Windows & Linux systems, Social Engineering, Password attacks etc. The author has explained in simple words with images which makes it easier to understand even for a layman. The primary concern of this book is pentesting for security. It focuses more on How an attacker can find and exploit weakness in system, For e.g. How to discover vulnerability in system, which can be exploited by a malicious hacker, and this is the most essential skill. This is for those who wants to become master because it covers series of chapters from basic to advance. The initial part wraps us common security testing methods and the middle section focuses on exploitation and post-exploitation methods. It also represent bypassing physical security, social engineering, web services and attacking network direct end user. The reader will also learn about network exploit and security. It follows a hacker methodology with all practical knowledge needed to test your security. If you're a beginner into IT Security field or appearing for any pentesting exam and you want to learn from beginning till end, then its for you. Do you want to hack your neighbour's Wi-Fi password but don't know How to? Well this book is dedicated to Wireless hacking & pentesting for freshers. It will teach you How to create WLAN Lab and experiment pentesting like bypassing WLAN Authentication, Encryption flaws and Attack clients, with in-depth tutorial. It follows pentester's methodology and focuses on advance Wireless attacks from Sniffing to Capturing WPA-2 keys. It also explores ins and outs of wireless technologies which is a very exciting part indeed. Web also known as INTERNET is another major part of today's technology, and with this level of advancement security and privacy concern rises. This book is completely dedicated to Web pentesting covering wide range of lessons on SQL Injection, XSS, Exploiting server flaws, Authentication & Hijacking techniques etc. It teaches you How to find vulnerabilities in Web-Apps and Site using the most effective tools available for Web Penetration Testers. Apart from testing it also educates its reader on securing Web and its components, like patching flaws and preventing malicious exploitation. It's normal to get confused while choosing the most appropriate book for yourself because you may not have the slightest of idea which could be most useful for you. In my advice first of all you must recognize your interest and buy according to your status (Newbie, Intermediate or Expert), for instance if you're interested in Wireless hacking but you're a fresher, then you should go third one. In case if you are already aware of basics you can go for medium level books. I'm myself very fond of InfoSec professionalism, sometimes people refer it as an expert level. It would be unwise to think that only reading is enough to become expert... NO! Training is vital. The more you practice the more you'll gain experience and knowledge. Do not just read and memorize the tutorials instead understand it completely and then do it on your own in a Pentesting Lab which is safe and beginner friendly.